These fun books for 3-8 year olds were sent to me by the author. Each is just over 20 pages long with colorful illustrations and enough text to give kids the basics of life around the world through the eyes of someone their age. Gage wasn’t as interested in the learning as he was the pictures, but I learned a lot 🙂 We learn where each country is on the globe, information about their capital city, common names, what they call members of the family, big attractions, food, fun, traditions. It covers all the simple facts and I think these are great additions to any child’s library. 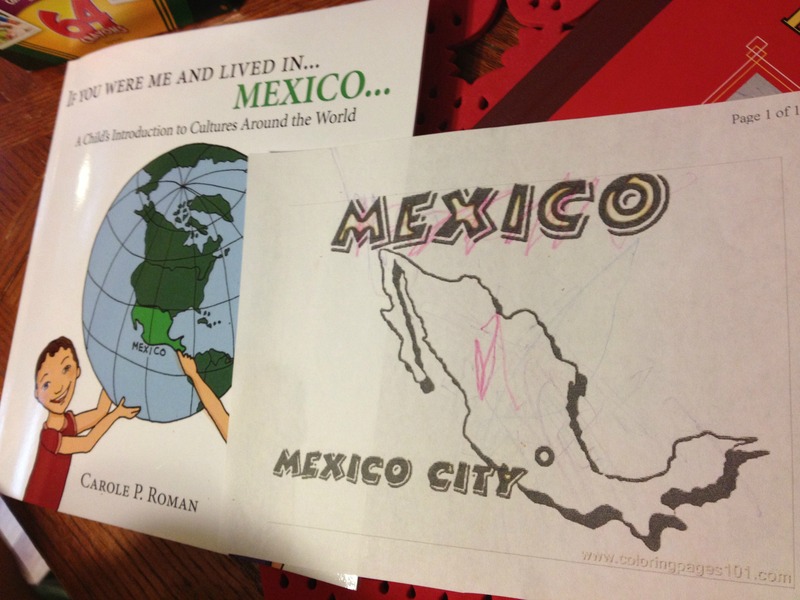 For the Mexico book Gage colored a map. It may not look like much to you, but since he used other crayons in addition to the purple one it is a huge accomplishment. 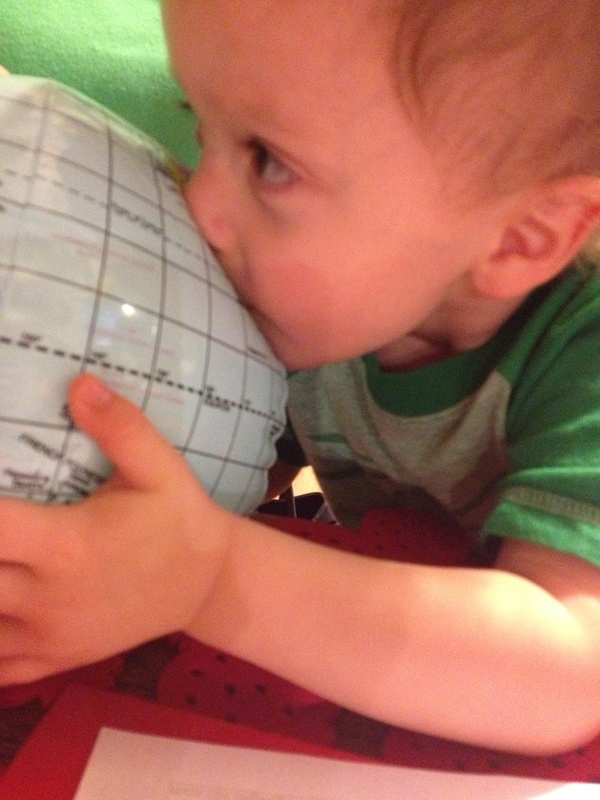 The author also sent us a blow up globe and as Gage looked through the book and colored I blew it up. When I gave it to Gage to show him where Mexico was this is what happened. He really just wanted to blow it up like mommy. 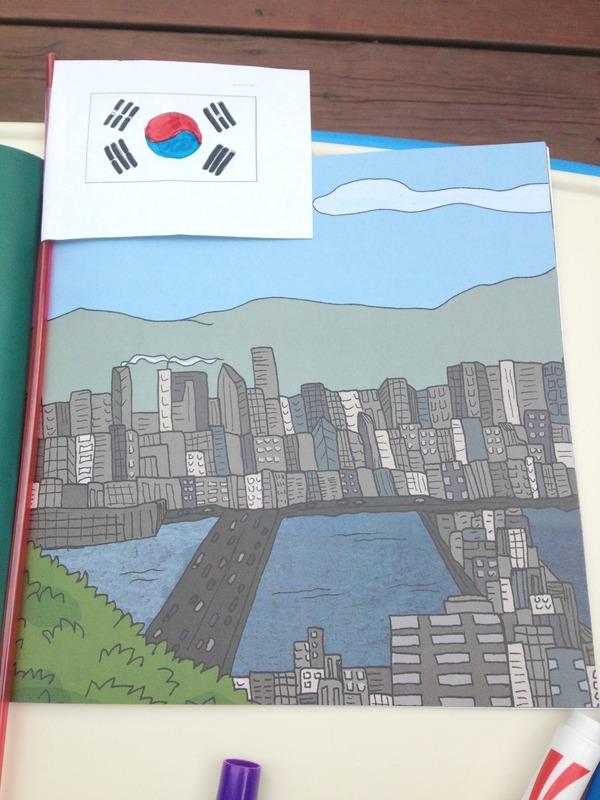 For the South Korea book the author sent a flag and I thought it would be fun to make our own. 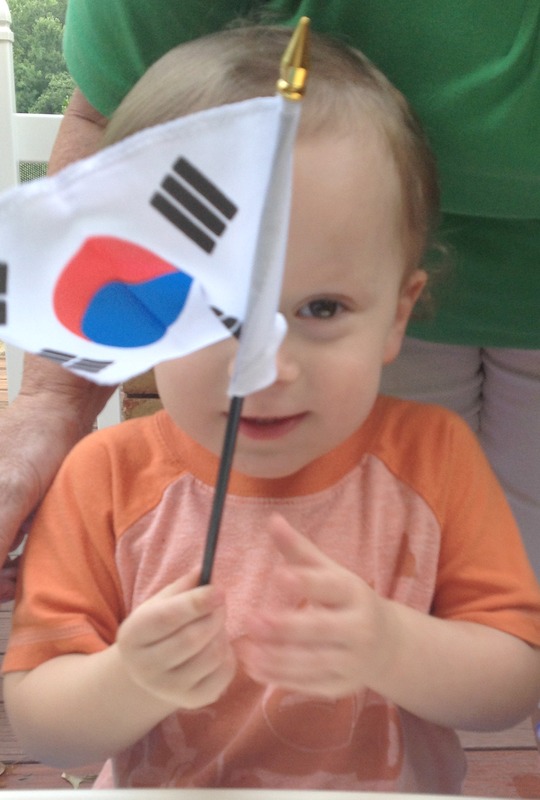 No matter how much I tried to get him to color the flag (I even tried to bribe him with purple!) all he wanted to do was run around the deck waving the flag. So, I made it myself. I know there have probably been quite a few of you who have made it to Mexico, but are there any who have visited South Korea? I wouldn’t mind blowing up that Globe!! He looks so happy…..! 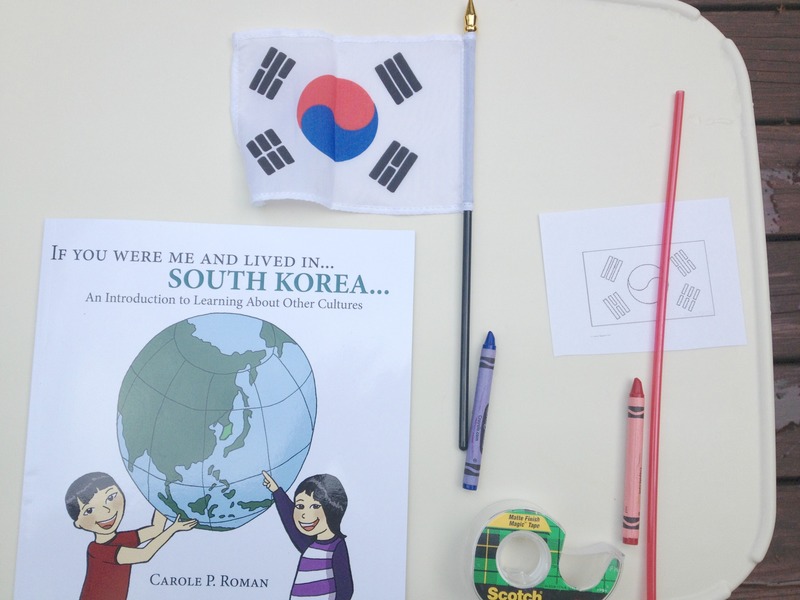 I haven’t been to South Korea but one of my daughters dated a young man who taught English there for a year. He liked it. I haven’t been to either place. 😦 The books look great – I’m sure Gage will appreciate them more as he gets older. Looks like he had fun! I’ve been to Mexico. I’m with Gage, I like purple too. So cool! Gabe loves his Children’s Atlas. Looking at maps and talking about the countries. These look fabulous! Gage is such a cutie! What a fun lesson! I have never been to South Korea. And I’m not sure Tijuana really counts as being in Mexico, even though technically it is. 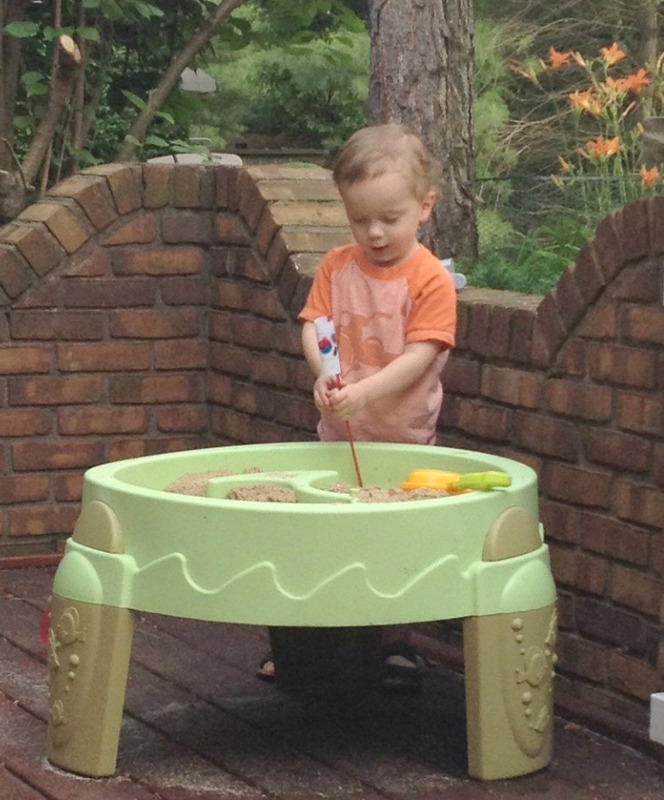 Stacy, what a great lesson for Gage:) Love the sand table – perfect. Ha! I love that kid!